The May 21, 2011 issue of New Scientist ran a feature called “Uncrackable Codes”, which featured MacGregor Campbell’s summaries of eight famous unsolved mysteries: Somerton Man, Beale’s buried treasure, the MIT time-lock puzzle, Kryptos, the Voynich Manuscript, Enigma, Elgar’s unread message, and the Zodiac Killer. 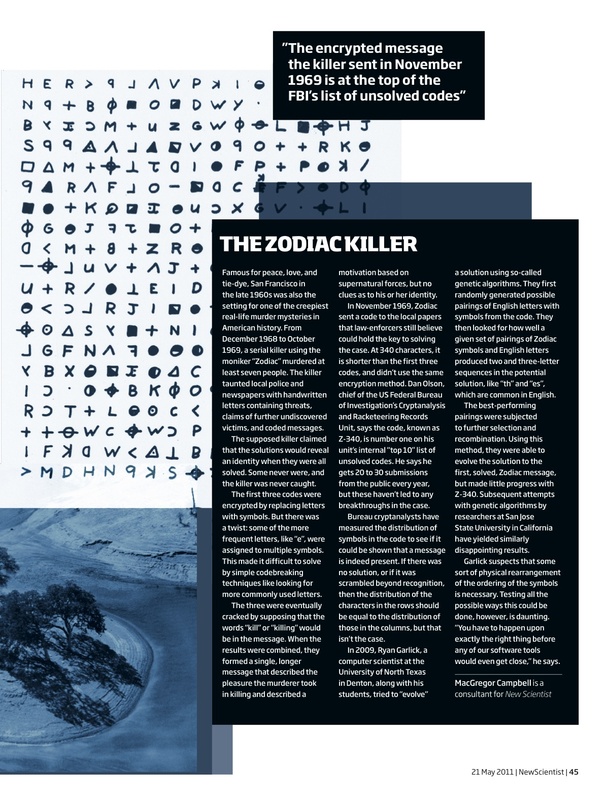 “In November 1969, Zodiac sent a code to the local papers that law-enforcers still believe could hold the key to solving the case.” This seems like wishful thinking. Cracking the 408 didn’t catch the killer. But maybe this wish will come true. FBI crypto chief Dan Olson says the 340 “is number one on his unit’s internal ‘top 10’ list of unsolved codes”, and that that he gets about 20 to 30 submissions every year from the public. None have led to breakthroughs. FBI cryptanalysts believe the 340 contains a real message, since the distribution of characters in the rows is not equal to the distribution of characters in the columns. Olson describes this in more detail in the emails he sent to Tom Voigt back in 2009. In 2009, computer scientist Ryan Garlick led his students in an attempt to use genetic algorithms to crack the cryptograms. The attempt was successful for the 408, but not the 340. Another attempt at San Jose State University also failed to produce a solution for the 340. All the research seems to be centered on attacking the 340 as if it is a simple substitution cipher. Most papers report succeeding at breaking the 408 and failing with the 340. I’ve yet to see any academic research into the idea of rearranging the 340’s symbols, or exploring its other qualities that might offer clues into how it is truly constructed. This seems to point to falsifying the hypothesis that the 340’s plain text is written in valid English, arranged in a normal direction, and enciphered using straightforward homophonic substitution. My guess is that exploring all the strange variations that are possible would result in tools that are too specific to apply to other “pen and paper” style ciphers. A lot of work for potentially zero reward. Who’s up to the challenge? Sounds like an interesting article. Thanks for the summary of academic activity. I knew there had been a few activities, but I was not aware that there had been that many. I think most of us who have spent a nontrivial amount of time trying to solve the 340 by way of computer program have come to the conclusion that the cipher is something more than a standard homophonic substitution cipher (HSC). I personally believe that the cipher is fundamentally a HSC, but that the killer introduced one or more complexities that have thus far frustrated all those who have taken up the challenge. The problem I see is that there are no good way to infer what the additional complexities actually are. The possibilities are infinite. If somebody is actually going to solve the 340, they are going to need a fair bit of luck in order to essentially “guess” one or more of the complexities. True. It’d be nice to at least formally exclude the complexities that have been attempted and can be confidently ruled out. Or to develop a heuristic search that can successfully explore a space of some subset of those complexities.